Spirituality Beyond Religion: What does that mean? It means to enter a realm of spirituality that connects you with God, with your fellow living beings, with the environment, with the earth and the universe. A level of spirituality that is beyond a mere dogma that counts its profits in terms of converts, and a spirituality that directs one to see the true unity between all of us, and provides a respect for all traditions whose goals are the same as those listed above, in whatever form they may be. There is a joke that says, God gave us genuine spirituality for all humanity. But then the devil came along and organized it and called it religion. In this way, my point is that spirituality existed before it became codified. So if the major religions we find today are primarily based on the idea of adhering to a codified or organized dogma, and then trying to push it on everyone else as much as possible as if it is the one and only way to some kind of salvation, while taking only a secondary consideration for a person’s genuine spiritual development, then let those religions go back to the devil and let us utilize our right to practice a genuine form of spiritual development that unites us rather than divides us. Those paths that can bring forth genuine spiritual experiences are beyond the limitations of time and space, or the label or name of any one particular religion. Such spiritual paths that can bring a universal spiritual realization of the Absolute Truth also invoke the perception of the same divinity embodied in everyone. This is what the world needs today. Instead of dividing us into various forms of “sinners” or “saved”, or various religions, subsects or ethnic groups, we need a spirituality that connects us with each other, with the universe, the world and the environment, and to see that it is all a part of the Divine. I personally am of the contention that it is not enough to merely respect each other’s spiritual path, but if we go back to a time before the world was interrupted by the major monotheistic religions of today, we can go back to seeing the real similarities that existed within all of the indigenous traditions and cultures of the world. We can see how they are like branches of the same tree of spiritual truth, called in Sanskrit as Santana-dharma. Thus, Sanatana-dharma is not a part of every religion, but every genuine religion is a part of Sanatana-dharma. Therefore, more than merely respecting each other, by looking at the roots of the indigenous cultures around the world and recognizing their similarities, we can see that we are like each other’s brothers and sisters, sharing the same roots and principles of spiritual purpose. Thus, there is no reason to work for converting each other from one path to another. There is only the organic and natural progress from one level of understanding to a deeper level. In this way, we are not divided into those who are sinners and saved, or those going to heaven and those going to hell. We, meaning those of us who are sincere, are all working for similar goals of spiritual understanding, and can give each other the respect and encouragement to continue on the road of spiritual progress and development, and even gain insight by sharing the similarities that exist between us and the cultures from around the world. It is indeed “Spirituality Beyond Religion”, which I feel needs to be the way of the future if we are really going to have peace in the world, since most of the violence, war and terrorism on the planet today is due to the superficially perceived religious differences. This is one of the reasons why there was a recent conference by the name “Spirituality Beyond Religion” in Jaipur in February of 2006, by the World Council of the Elders in partnership with the World Council of Ethnic Religions based in Europe. These elders are those who still participate in a variety of the world’s oldest cultures, traditions and indigenous spiritual paths. There are presently over 750 members of the World Council representing more than 75 different cultures from over 60 countries worldwide. This conference was sponsored by the International Center for Cultural Studies (www.iccsus.org) in India and the U.S.
From the ICCS there were many volunteers who did an excellent job in assisting the attendees. Especially my friend Yashwant Pathak, a key person in the ICCS and another member of the Vedic Friends Association, who is a dynamo in organizational abilities. Plus, for me it is always a happy occasion to see so many old friends that I have met before in my travels through India or at other conferences that we have attended. It is always a time to catch up with their activities and reflect on the progress that has been made or yet needs to be accomplished for the upliftment of Dharma in the world. So it is wonderful to see familiar faces but to also make new friends who may be from different parts of the planet, yet who share the same concerns. Thus, we leave the conference with a positive feeling that our family of concerned and active friends is certainly growing. So I encourage everyone to investigate further the activities of the ICCS and become a part of it. The conference was a grand success with delegates from 33 different countries coming together to share and respect their spiritual and cultural similarities. These countries included: 1. Australia, 2. Bangladesh, 3. Belgium, 4. Bhutan, 5. Canada, 6. Costa Rica, 7. El Salvador, 8. France, 9. Germany, 10. Ghana, 11. Guatemala, 12. Guyana, 13. India, 14. Indonesia, 15. Israel, 16. Kenya, 17. Latvia, 18. Lithuania, 19. Malaysia, 20. Mauritius, 21. Mynmar, 22. Nepal, 23. Poland, 24. Scotland, 25. South Africa, 26. Sri Lanka, 27. St. Lucia, 28. Suriname, 29. Sweden, 30. Switzerland, 31. Trinidad and Tobago, 32. Ukraine, and 33. USA. Now you may ask, how could people from so many different countries and cultures get together and cooperate so well if they had focused on religious differences rather than reasons for uniting? The point is that by understanding our spiritual similarities, I can say that we naturally felt like brothers and sisters that were coming together again after hundreds of years of being separated, mostly because of the damage that has been done by dogmatic views in monotheistic faiths. However, now we were able to be free to gather with the elders of all of the old cultures and see how they are rising in numbers as the world is increasing its interest in the old and indigenous ways. It was a great celebration! After all, many of these ancient cultures and traditions of the world have survived only by their own inner strength in spite of the massive efforts that invaders have used to try to eliminate these wonderful customs or convert them all into another religion. ● The spiritual experiences of the elders in different traditions. ● The rituals and purpose of the expressions of the ancient customs. ● Roles of the individuals seeking higher understanding. ● The inter-relations of spiritual experiences of different cultures. ● Incorporation of the ancient spiritual values in modern life. ● Using the holistic approaches that are found in the indigenous traditions for solving modern problems. ● The similarities in symbolism of the various ancient cultures. Many of us roomed at the OTS campus where the conference was held. The typical daily schedule was to have an early Indian style breakfast. All meals were great vegetarian food. This was followed by being bused to the Jawahar Kala Kendra cultural center for morning ceremonies and rituals performed by various delegates from a few of the different cultures. Then back the OTS campus for a keynote address by a noted personality. Then a few hours of lectures and talks on various topics by some of the delegates. Then a delicious vegetarian lunch, followed by another four hours of interesting and sometimes controversial talks and lectures, sometimes on the ways of the ancient spiritual paths, and sometimes others on how to maintain the freedom to practice the old ways. By six PM there would be a yoga and meditation session by one of the noted teachers who were attending the conference. Then there would be another great multi-course vegetarian dinner with numerous Indian preparations, after which we would be bused to the Jawahar Kala Kendra for evening cultural programs. These were often put on with the help of the Rajasthani Tourist Department and provided an assortment of folk dancers and singers from various parts of Rajasthan. These were most entertaining and the dancers would always amaze the audience by their moves and colorful clothes. Not all days were alike. On some days we went out on field trips that included visiting schools in the area to show the students the similarities they could share with other cultures of the world. We also went for a visit to the Jaipur Sanskrit college, and later a tour of the beautiful and elaborate Amber Palace. One evening we had dinner, an extravagant buffet, in the attractive and royal Sisodia Rani Gardens, while Rajasthani folks dancers performed on a central stage in the grounds. The whole five-day conference was not only an opportunity to interact with other elders of the old traditions, but also to experience various aspects of Indian culture that the usual tourist would never be able to witness without special arrangements. So we all felt especially privileged to have been a part of this conference. * We, who worship the divine, are committed to follow the path of true “Spirituality Beyond Religions”. All of us shall strive to honor the diverse spiritual and nature worship traditions that uphold the dignity of human beings, transcending the barriers of language, race, caste, creed, color, economic status and technological developments. * This congregation considers any type of religious and/or dogmatic conversations to be a travesty of truth and defying the very basic urge of spirituality. We commit ourselves to help fellow beings and societies who have been swept away, oppressed or converted to other faiths while under duress, to come back to their own ancient faiths and follow the religious practices that enhance peaceful co-existence. * In today’s enlightened world, use of the terms such as “kafir”, “followers of heathenish faiths”, “devil’s emissaries”, etc., while referring to non-believers, has to be regarded as not only anti-democratic and utterly insensitive, but also dogmatic and anti-humanitarian and a great sin in the moral sense. Damning a human being or a society in such manner goes against the philosophy of tolerance and dignity of human beings. 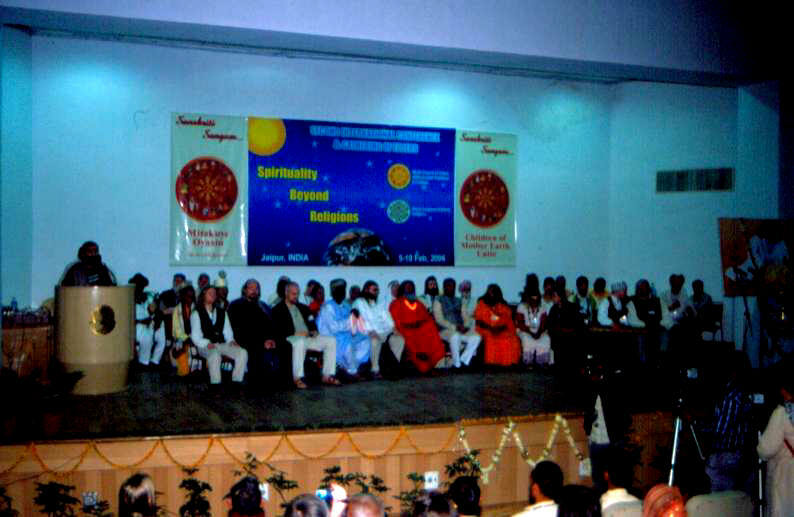 * This gathering undertakes the task of upholding ancient spiritual traditions and will devote all its energies and resources to help those individuals and societies to bring back in practice, resurrect and re-enact the ancient spiritual traditions which would enhance mutual understanding at a global level. 1. Bestow on us the life of peace, prosperity, freedom and amicable living. 2. Let the crookedness and hate and anger in the minds of fellow human beings vanish. 3. Give us the strength of mind and body to work for making our Mother Earth as Your abode of peace, divinity and sublime love. Metakuye Oyasin (We are all related), Til Ars Ok Fridar (Prosperity and peace for years). 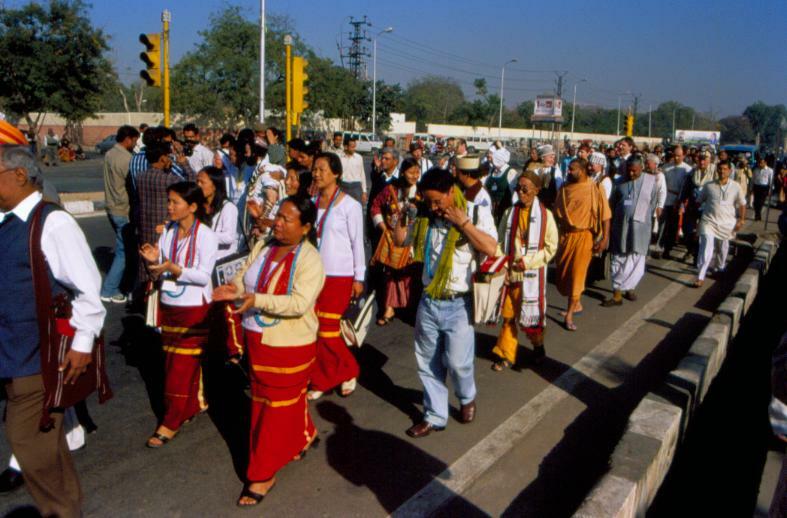 Delegates from 33 countries participate in the "Spirituality Beyond Religion" conference inauguration parade in Jaipur. 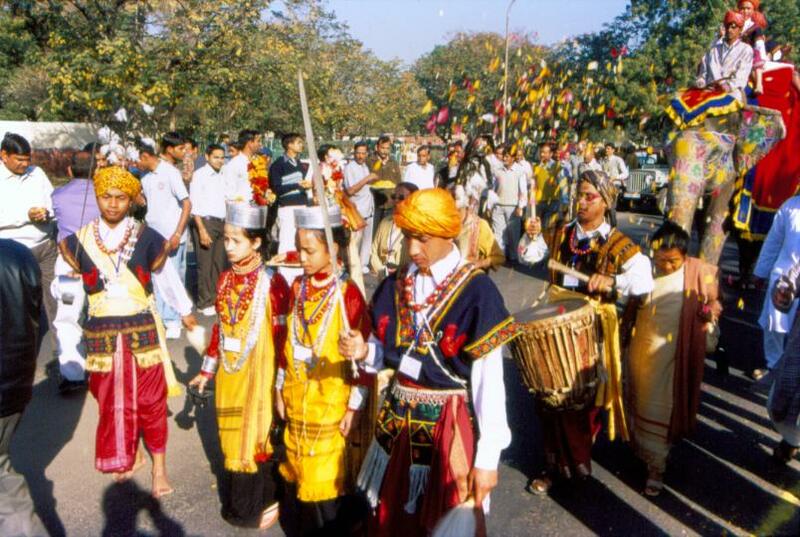 Another view of the parade showing delegates from Arunachal Pradesh, Latvia, Lithuania, the USA, Jerusalem, Trinidad, Guyana, India, and many other places. 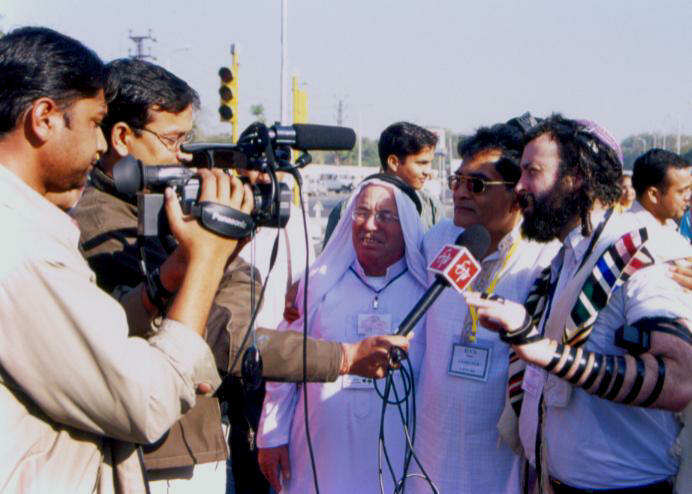 The local press gave the event much coverage, here interviewing a Muslim from Jerusalem on one side and a Jew on the other, both of whom are good friends. 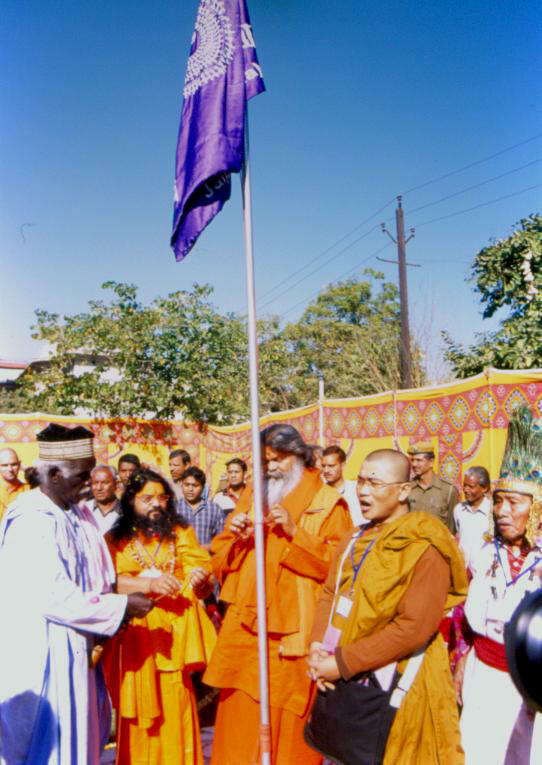 Raising the flag with Swami Maheshwarananda in the center, at the inauguration of the conference outside the Birla auditorium. The first major event of the conference at the Birla auditorium with all the major delegates and additional special guests from 33 countries on stage to give introductory talks. 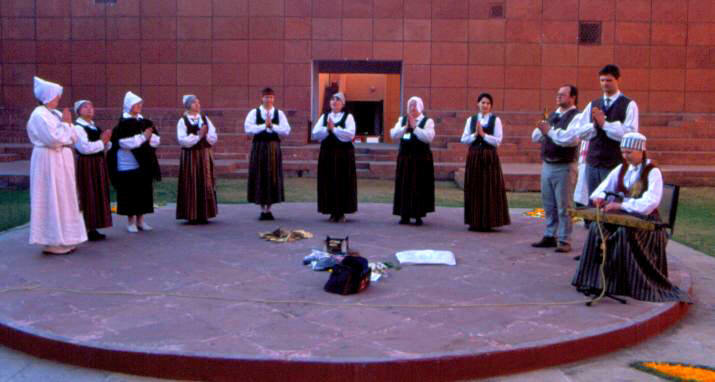 Morning songs and dances of the old traditions exhibited by the Latvian delegates. 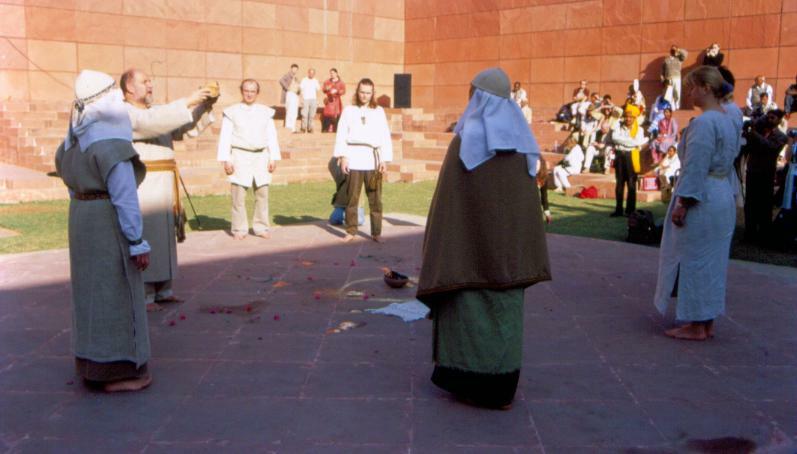 Morning prayers and rituals being exhibited by the delegates from Lithuania of the ancient Romuva religion. 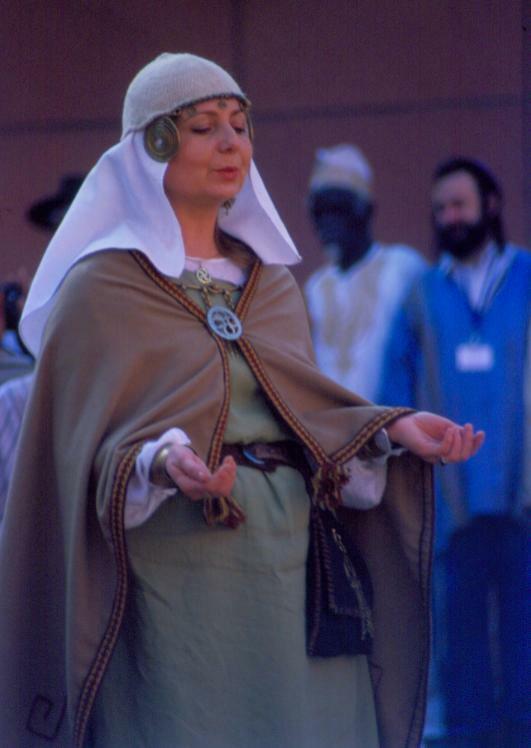 A close up view of a Lithuanian lady in the traditional clothes of the Romuva religion. Other delegates watch in the background. Some of the evening entertainment at the conference included folk dancers and singers of Rajasthan. Another view of some the Rajasthani dancers as conference participants in front get photos. 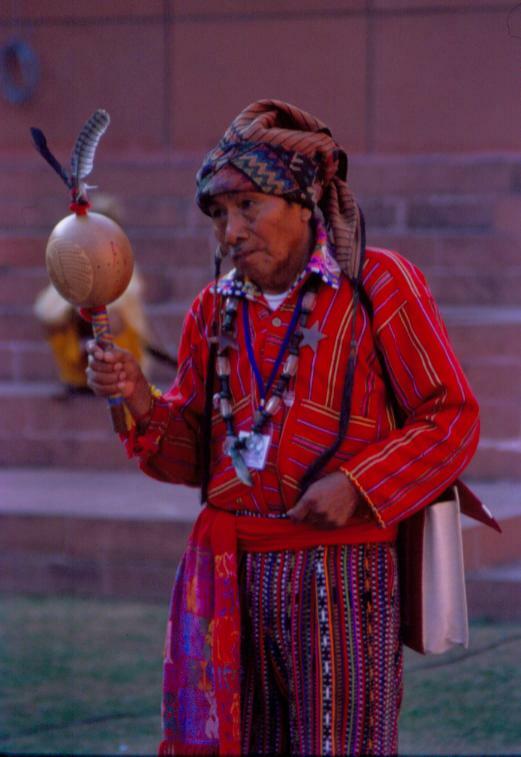 Alejandro Oxalez, a Mayan elder from Guatemala doing a morning ritual. 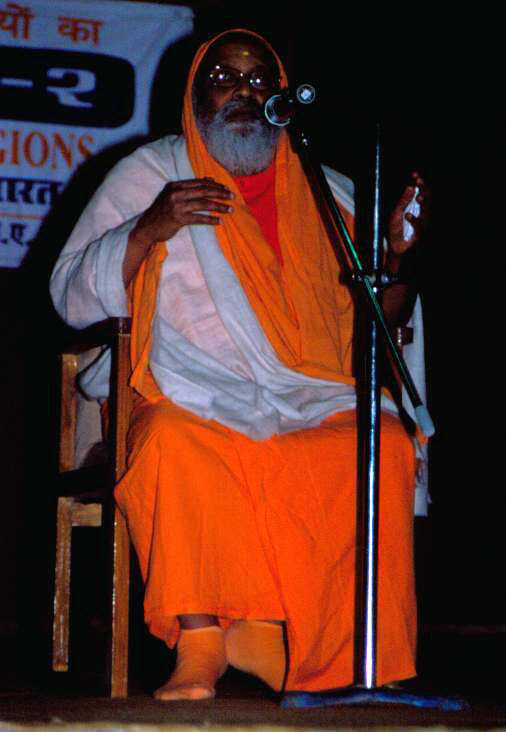 One of the keynote speakers that gave a morning lecture was Swami Dayananda Sarasvati. 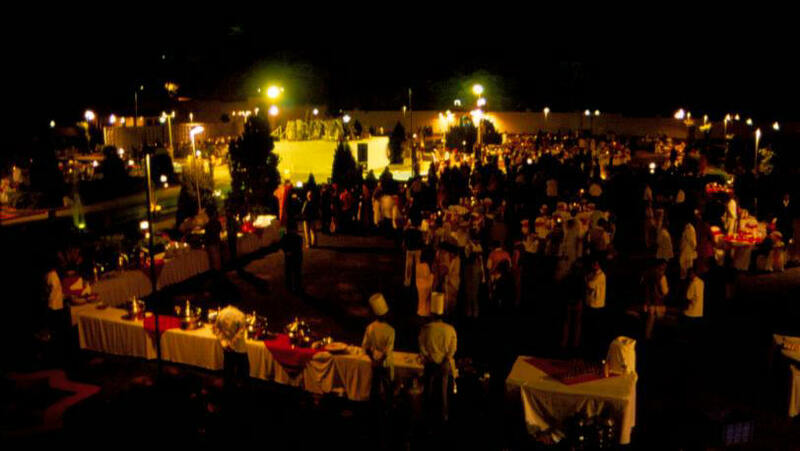 One evening dinner was offered at the elegant and royal Sisodia Rani Gardens. 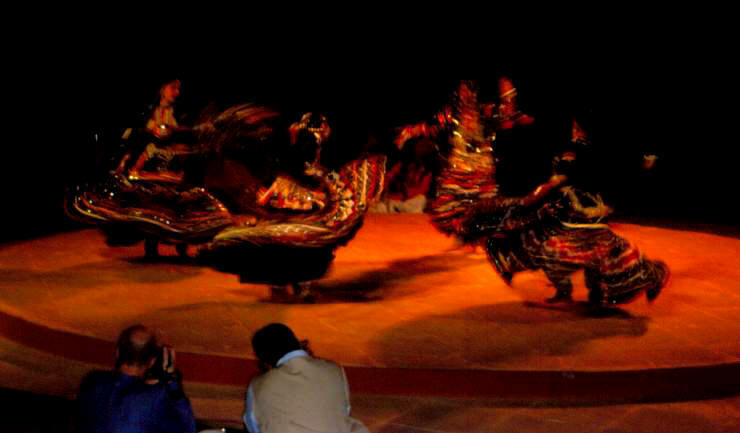 A center stage had different Rajasthani dancers and singers performing for the pleasure of the participants. 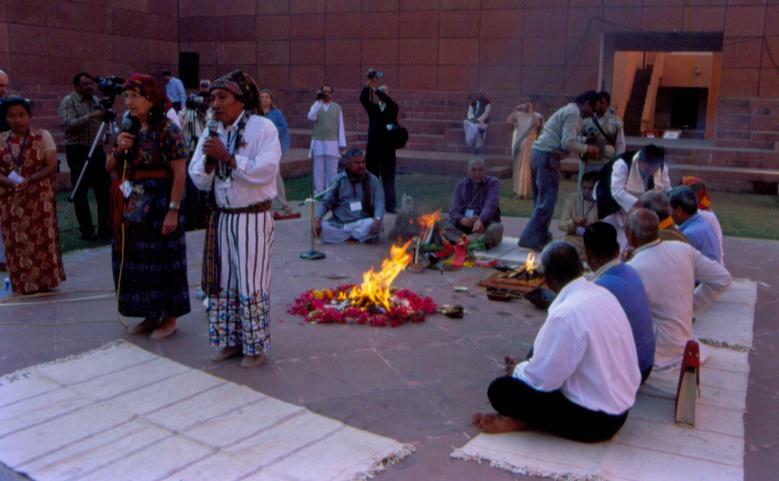 During one morning there was held simultaneous Mayan and Vedic fire rituals. This was especially interesting to see the similarities between the two, exhibiting how they had to have come from the same source of culture, sharing the same roots of origins. 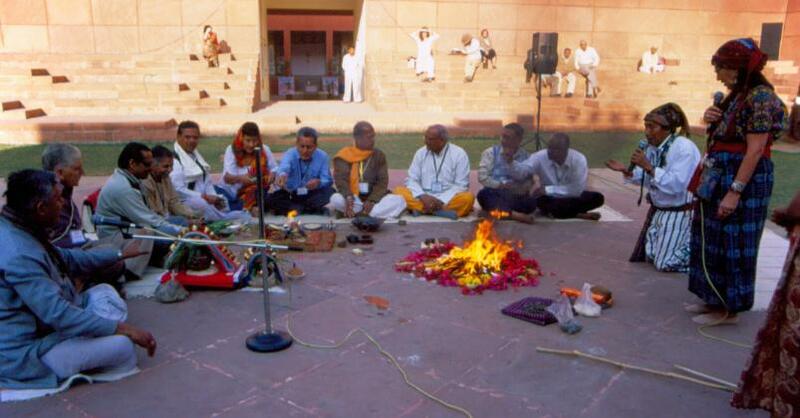 Another view of the simultaneous performance of the Mayan and Vedic fire rituals, held on the last day of the conference.